In numerous diseases such as malaria or cancer, diseased and healthy blood and body cells differ in their degree of hardness. Now, they can be easily separated from each other by a new physical effect. In the process, flow through microchannels ensure that the cells separate out into streams of harder and softer cells. This has now been discovered by an international research team led by Bayreuth physicist Prof. Dr. Walter Zimmermann. In the journal Physical Review Letters, the scientists present their fundamental findings and demonstrate their potential for medical applications. Microchannels have tiny diameters of between just 10 and 500 micrometers. When blood cells, body cells or soft capsules in the flow of an aqueous liquid are led through such tubes with straight walls, they are set into rotary motion by the flow. In this way they move towards the centre of the tube as if towards an imaginary line of attraction ("attractor"). This line then becomes the path along which all of the particles travel – irrespective of their hardness or size. Research groups at the Universities of Bayreuth and Grenoble found the explanation for this phenomenon several years ago: The decisive factor here is that soft particles change their shape under the influence of the pressure and flow conditions inside the tube. "We were therefore curious to see how soft particles behave when they migrate in the flows that arise in microchannels with undulating walls. These tubes are of symmetrical shape, because they have a straight longitudinal axis, but their diameter becomes alternately smaller and larger. It had never before been investigated how the migratory movements of particles change under these conditions," reports Zimmermann. A new project by the two research groups in Bayreuth and Grenoble and the Jülich Research Centre has now led to some surprising results: In the tubes with corrugated walls, not only is there a line of attraction in the middle of the tube, but two other lines of attraction form as well. These run parallel to the walls, between the middle of the tube and the two walls, and are also wave-shaped. Softer capsules move towards the centre of the tube in the flow, and continue on their way along this longitudinal axis. Harder capsules, on the other hand, are diverted towards the wavy lines of attraction. "On the basis of this fundamental physical discovery, we wanted to find out whether applications for medicine could be derived, and have investigated the behaviour of harder and softer red blood cells," says Winfried Schmidt M.Sc., doctoral student in the elite study programme Biological Physics in Bayreuth. There are numerous diseases, such as malaria, cancer or diabetes mellitus, which cause the hardness of red blood cells to change. Depending on the disease, diseased blood cells are either harder or softer than healthy blood cells. It turned out that in all these cases diseased and healthy cells can be separated using this same simple procedure: They travel in the microchannel to different lines of attraction and can be collected separately at the end of the tube. In this way, it will probably be possible to draw conclusions about the severity of a disease along with other characteristics. 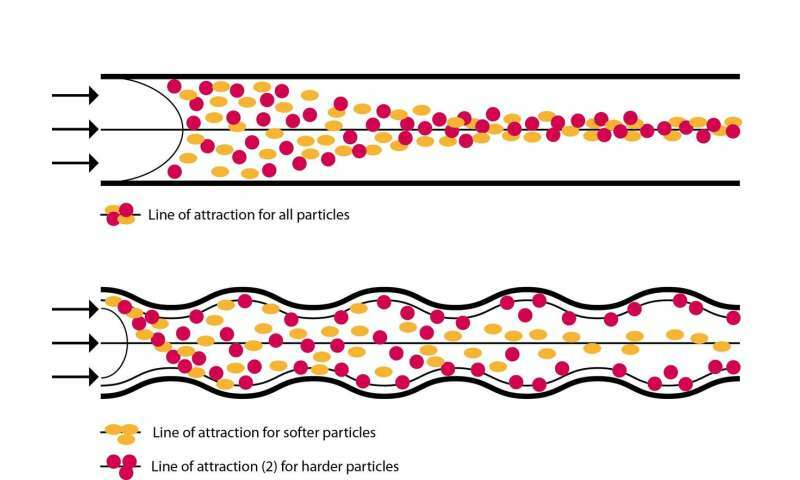 Further potential applications arise from the fact that not only harder and softer, but also larger and smaller soft particles can be separated in this way: Smaller particles travel along the longitudinal axis, whereas larger particles follow the wavy, outer attracting lines. The findings now published are an example of how much basic research in physics is being driven by modern computers and mainframes. "We have achieved our results through theoretical considerations and calculations as well as through computer simulations. Physical Review Letters, one of the world's leading physics journals, found our study so convincing that it was accepted for publication even without experimental testing," says first author Matthias Laumann M.Sc., Ph.D. student at the University of Bayreuth. "We would be delighted if our publication stimulated experiments in which other research groups discovered further exciting potential applications, both in the field of medicine and beyond," adds Zimmermann.